The Ichimoku Kinko Hyo, also known as the Ichimoku Cloud, is a versatile indicator that defines support / resistance, trend direction, momentum and trade signals.The indicator was developed by Goichi Hosoda. The most characteristic feature of the Ichimoku indicator is the cloud (Kumo). It is comprised of two lines, the Senkou Span A (green) and the Senkou Span B (red). A trend can be found by determining whether prices are trading above or below the the cloud. 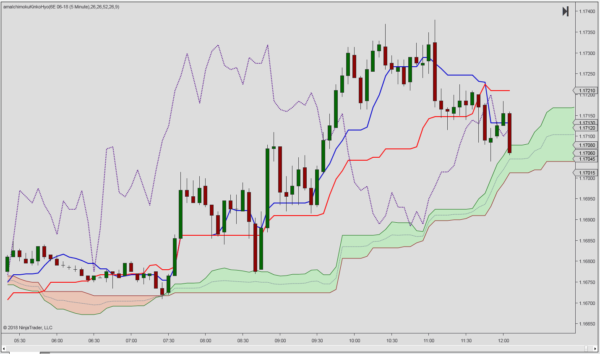 If prices are trading within the Ichimoku indicator cloud, it indicates a sideways market. The relationship between the two is similar to that of a 9 and 26 period moving average. The 9-period is faster and follows the price plot relatively closely whereas the 26-period is slower. The 9 and 26 Ichimoku indicator periods are identical to those used for calculating the MACD. The most favorable setups are aligned with the cloud and the major trend (above green cloud = bullish / below red cloud = bearish). You may also use the Ichimoku indicator to locate support for retracement entries in an uptrend. Conversely, one may use it as resistance for retracement entries in a bigger downtrend.